According to the legend, the ancient town of Mir received its name from the “emir”, when there was a detachment of Tatars, according to another version – from “the world”, thanks to the neighboring border of Russia and Lithuania. 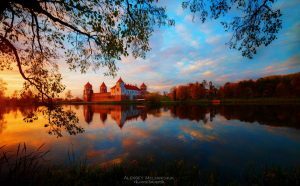 The construction of the castle as a family residence began in the 16th century with the marshals of the Grand Duchy of Lithuania Yury Ilyinich. Initially it was a small square fortress with four towers in the corners and a fifth – above the entrance gate. 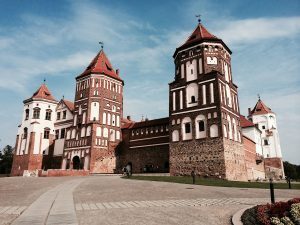 The first half of the XVII century became the peak of the heyday of the Mir Castle. From the second half, a period of destruction began. During the war of the Polish-Lithuanian Commonwealth with the Moscow State, the Northern War, the Patriotic War of 1812, the castle was repeatedly ruined and the owners lost all interest to it, and the land was leased out. In 1891 the estate with the castle was bought by Prince Svyatopolk-Mirsky, the ataman of the Cossack Troops of Don. One of the reasons for acquiring the heritage of the Radziwills was the belief that their surname derives from the name of the town. The Prince built a two-storeyed palace near the fortification (not preserved until our days) and founded a distillery. 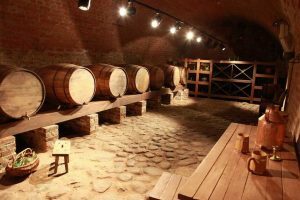 There is a legend that under the estate was dug a long tunnel that connects Mirsky with the neighboring Nesvizh castle, so wide that it could freely drive a team harnessed by a three. But the researchers could not find anything. Another legend relates to the English landscape park, which the new owner laid on the site of the former garden. When cutting down the old garden, the logger was killed and his mother cursed these places, shouting that from now on, one person for each logged tree will be drowned in the pond every year. The first drowned woman was the 12-year-old princess Sonechka, and in 1898 Prince Svyatopolk-Mirsky himself was found on the shore of the pond. After the death of the prince, his son Mikhail began work on the restoration of the castle in the 1920s, but the Great Depression of the late 1920s prevented their completion. During the Great Patriotic War, there was a ghetto in the castle, and in the post-war years the inhabitants of the village settled. 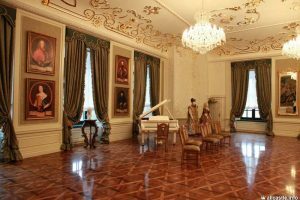 And only in 1987 Mir Castle was restored and opened as the National Art Museum of the Republic of Belarus. 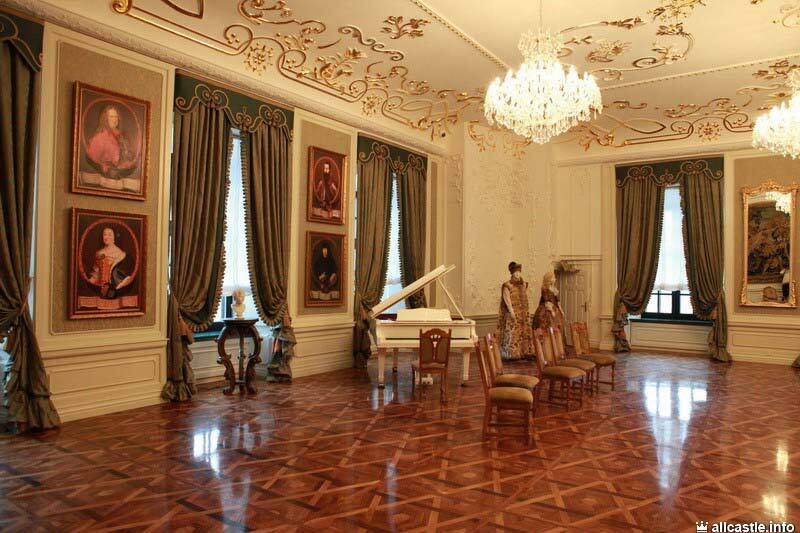 Currently, the Castle Complex Mir has 39 exhibition and exhibition halls. 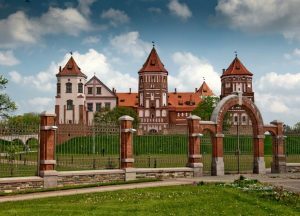 The Mir complex includes a castle, earthen ramparts, an English landscape park, the reconstruction of an Italian garden, a pond, an outbuilding, a church-shrine of Svyatopolk-Mirsky, a watchman’s house and a roadside chapel. The cloister-chapel of the princes of Svyatopolk-Mirsky (1910) was built by the architect Marfeld, who took into account the close neighborhood of the medieval castle and did not use the popular bulbous-dome completions at that time. On the main facade of the chapel-tomb there is a mosaic panel “Savior Pantokrator”, made in the Byzantine tradition in the private mosaic workshop of the Frolov brothers. Near the chapel is the guard house – a small, square in plan building, with an adjacent entrance arch with wrought-iron gates. 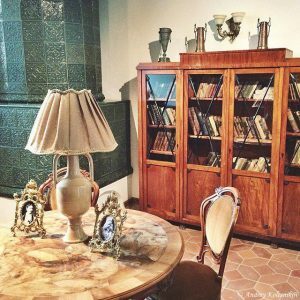 In the expositions of the museum you will see unique pieces of furniture, weapons, tapestries, etc. In the summer, near the walls of the Mir Castle, famous medieval music festivals and arts festivals are held.